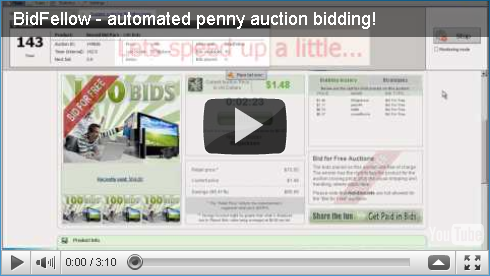 It's an automated penny auction bidder software: with it you don't need to be sit in front of your computer to place your bids in the exact time you want! You can set up many triggers to play smarter and maximize your chances of winning! It is very easy to use and works with more than 40 penny auction websites! Forget about "bid buddies". Most websites offer you this option to "help" you stay alive in auction while you are away - but they have in fact the opposite effect: they are so poor in settings and force you to place your bid so early. Stop wasting your money like that, with BidFellow you can optimize your strategy at the maximum! Example: you can setup it to place a bid when timer reaches 1.5 seconds, but only if date is later than 12/01/2010 03:00:00 AM, if price is greater than $70 and if you have at least 30 bids in your account! When a auction ends, you can receive notifications by email or make BidFellow play a sound, so you are aware of what is happening even if you are away from your PC at the moment! BidFellow logs everything that is going on in a auction: your own bids and other users bids. In that way you can monitor suspicous bidders and also make your strategy much better. BidFellow has many under the hood cutting-edge technologies: optimized for multi-core processors, anti-idle system, anti-freeze timers system and more. Besides all of that, it is a very lightweight software that won't slowdown your PC. I can consider myself lucky: in my first day using BidFellow, I won an iPad and a MacBook on QuiBids! Not bad for a trial software! It is so nice that you can set it up and go away from your computer knowing it is doing the job for you! Copyright © 2014 BidFellow. All rights reserved.